As always, a very insightful conceptualization of the market. I am still undecided about the third generation though. I think there is still some push and pull here. Communication, collaboration and socialization are important business activities in their own right to warrant separate applications. I don't think they can completely be subsumed in other workflows/applications. 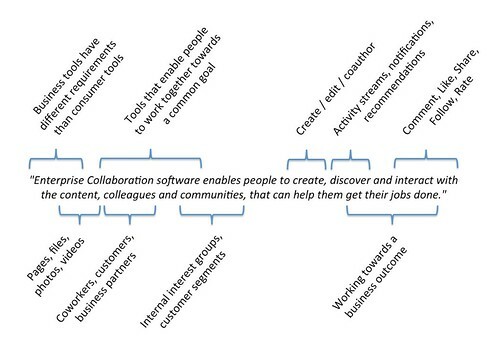 Every application having its own social aspect might lead to "social silos". Pankaj, thank you for the comments. I agree, applications having their own social features can lead to social silos... and I think that is a GOOD thing. Not everything needs to be shared with everyone. Information overload is a HUGE issue. The key is creating these tools in a way where the information can be kept separate, or shared when needed. For example, look at how SAP is doing JAM. You can have a conversation right on an ERP record, but that same conversation can then be accessed within CRM, or just in the generic JAM stream. Salesforce is going similar with Chatter.